CDEA has three key programmes namely: Culture and Governance, Documentary and Future and Organizational Development. The Culture and Governance Programme focuses on promoting inclusive or participatory governance in decision-making along the creative value chain as well as advocating for culture’s role in Sustainable Development by interweaving of cultural policies and other public policies. Key activities will be anchored within the decentralization framework of the East African Countries, supported by international and regional instruments such as the UNESCO 2005 Convention, the Universal Declaration of Human Rights, the African Union Plan for the Cultural and Creative Industries, the East African Community Market Protocol and Sustainable Consumption and Production (SCP) guidelines and the Creative City Planning Approach. 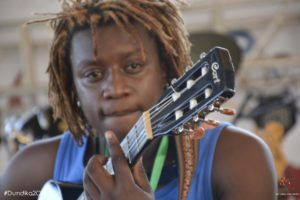 Culture and Governance Programme is currently implemented through research, policy analysis and advocacy in the culture and creative Industries in East Africa. At regional level, hosts an annual Mashariki Creative Economy Impact Investment Conference. CDEA’s future programming will be around peace and social cohesion, sustainable cities and tourism. S.M.Art Green Cities. S.M.ART refers to where Science Meets Art. This is a life-long initiative that CDEA has embarked on to work with municipalities in Dar es Salaam and later other cities in Tanzania and East Africa, on creative city planning as sustainable urban planning approach that embraces eco-friendly principles. This initiative falls within the theme Art, Urban Settlement and the Environment and Cultural Spaces and Public Art. Stimulating Intercultural Dialogue in East Africa . This initiative aims to CDEA will host Kikatuni Critical Debates that will stimulate intercultural dialogue around social issues from Kenya, Uganda and Tanzania highlighted through cartoons in newspapers illustrated by cartoonists. Midundo Online Radio and social media (Facebook and YouTube) will be the main communication tools. Eco Sanaa Terrace. CDEA has an arts space which provides the space for artists and arts lovers to network and meet through the following activities. 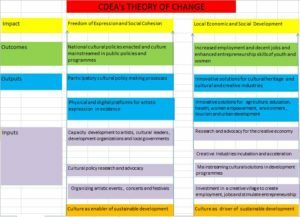 CDEA believes that culture is both an enabler and driver of sustainable development as illustrated in its Theory of Change.